The Electoral Commission has approved The Independent Group's application to register as a political party. The group - made up of 11 former Labour and Tory MPs who quit their parties in February - will become Change UK. The approval means they can put forward candidates in the European elections due to take place on 23 May - if the UK has not left the EU by then. But the Commission rejected the party's logo, saying it was "likely to mislead voters". Two former Conservative MEPs, Julie Girling and Richard Ashworth, confirmed they were joining Change UK and hope to stand as candidates in the European elections. Ms Girling said she was "fully committed to a People's Vote on Brexit" and was "looking forward to being able to use my extensive experience as part of the Change UK team". Meanwhile, cross-party talks between the government and the Labour Party are continuing this week to find a way through the impasse. Labour leader Jeremy Corbyn said no agreement had been reached and the government "doesn't appear" to be shifting its stance on key issues, including its opposition to a customs union with the EU. Change UK began to form when seven Labour MPs resigned the whip due to an ongoing row about the leadership's handling of anti-Semitism, and its position on Brexit. 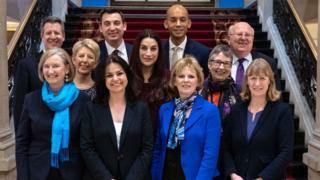 Two days later, another Labour MP, Joan Ryan, joined the ranks, followed by three Conservative backbenchers, who criticised the government for letting the "hard-line anti-EU awkward squad" take over their party. Since then, the group has been a vocal supporter of the "People's Vote" campaign, calling for another referendum on Brexit. 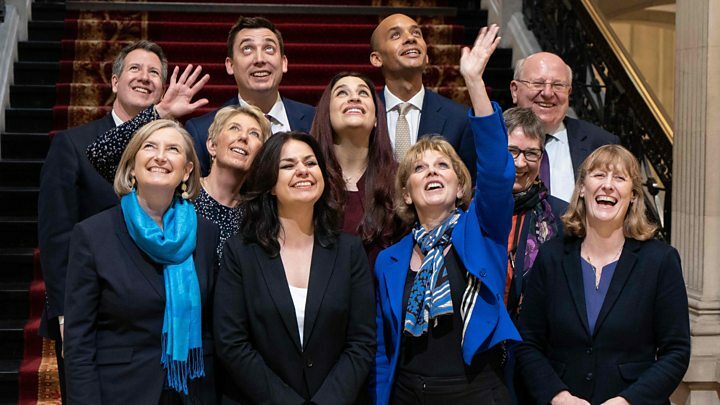 The 11 MPs sat as a grouping in Parliament called "The Independent Group", but applied to become a party at the end of March in case European elections went ahead. It did not meet the deadline for local elections in England, which are taking place at the start of May. Planning is already taking place for the European parliamentary ballot after the EU agreed to push back the Brexit deadline to 31 October. European Council President Donald Tusk has said the delay means the UK will take part in the elections and British MEPs could sit for "months or even longer". However, Theresa May has insisted the UK could still leave by 22 May and avoid taking part in the elections. There was some controversy over the choice of Change UK as the party name, with online petitions website Change.org saying it was "seeking guidance on the proposed use of our brand name". Who will stand in Northern Ireland? But the Electoral Commission has approved the application, with former Tory MP Heidi Allen as interim leader, and the party's registered name as Change UK - The Independent Group. Change UK has yet to say whether they have submitted a new logo. But in a press release, the party confirmed it would launch its European election campaign on Tuesday, 23 April after receiving 3,700 applications from people wanting to stand in its name.